Do you have a commercial roof in Denver? We specialize in protecting buildings with expert installation of new roofing and dependable repairs. We work around your schedule as much as possible, to minimize or eliminate disruption as the crews are on and around your building. Is your commercial roof in Denver flat or low-sloped? You may face a water retention problem. Whether you own a retail store, strip mall, factory or offices, you can’t afford to let problems go. Schedule your free inspection. You’ll get an honest answer as to whether you need replacement, from a company known for its integrity. • EPDM (ethylene propylene diene terpolymer) is a synthetic rubber that has been proven highly resistant to ozone damage. It is flexible, so the freeze-thaw cycle will not weaken it. Hail will not dent or scour it. And it holds up to wind damage. • TPO roofing (thermoplastic olefin) is a surface that offers many of EPDM’s advantages, but with a thickness that allows extra emissivity of absorbed heat. It is ENERGY STAR certified and Cool Roof rated when used in light colors. It has been shown to resist wind, hail, rain and UV radiation. 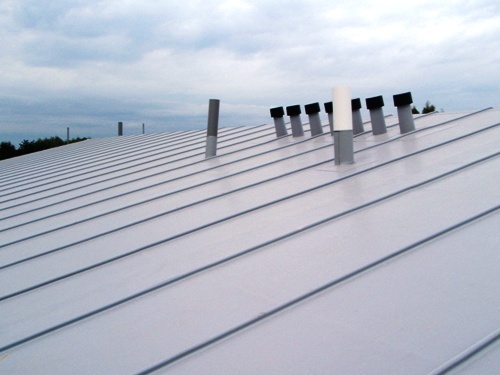 • Elastomeric surfaces cover a wide range of specifications. We offer cost-effective granulated self-adhering modified bitumen roofs. You will not have to worry about keeping water, hail, and extreme temperatures out. A single-ply commercial roof in Denver will be warranted for 10 to 20 years – depending on material – but can last much longer with routine cleaning and maintenance. You have found a company that can put you on a regular maintenance schedule for peace of mind. You’ll know if there’s something that needs to be fixed, long before you have a problem on your hands. A metal commercial roof in Denver can last 50 years or more, making it a superb investment with unprecedented ROI. The wide variety of panels and shingles available are suitable for many applications and slopes. Let us help you choose the right type for your building. Select from aluminum and steel, with a variety of protective coatings. We also install classic copper. Do You Need Commercial Roof Repair? A commercial roof in Denver with a slope of 2:12 (9.5 degrees) or less does not shed water as easily as surfaces with a higher pitch. Water ponds on it. If your system has been degraded by years of UV exposure at high altitudes, both sun and rain are working against your building. It needs attention. Schedule an inspection. We are the experienced and knowledgeable roof contractor for inspection, repair and maintenance. • You may need a new commercial roof in Denver if your surface shows signs of wear, aging and years of hail damage. Don’t guess. Get knowledgeable answers. • If your surface has leaks that you can see inside, let us pinpoint the source and stop it fast. Once we know the extent of the damage, we can recommend long-term options. Roofing materials have the longest useful life when properly applied. We stand by our workmanship, with a five-year warranty that is rare in this area. • Membranes are rolled out carefully and adhered fast to the decking. They won’t lift in windstorms. • Seams are thermo-set for a continuous surface that will not let rain and snowmelt penetrate. • You will have the right kind of insulation for extra energy efficiency. • Insulation also creates a slight slope that sheds water better. • Whether you need replacement, repairs or maintenance, call the local, family owned firm, doing business since 1984. Get honest work, fair prices, and best practices.Call now at 303-294-9535 for a free inspection. Call us to service your commercial roof in Denver, Lakewood, Thornton, Northglenn, Brighton, Broomfield, Boulder, Westminster, Arvada, Golden, Littleton, Highlands Ranch, Cherry Hills Village, Greenwood Village, Aurora, Parker, Castle Pines, Castle Rock, Evergreen, and Centennial.